San Diego Unified sold Props. 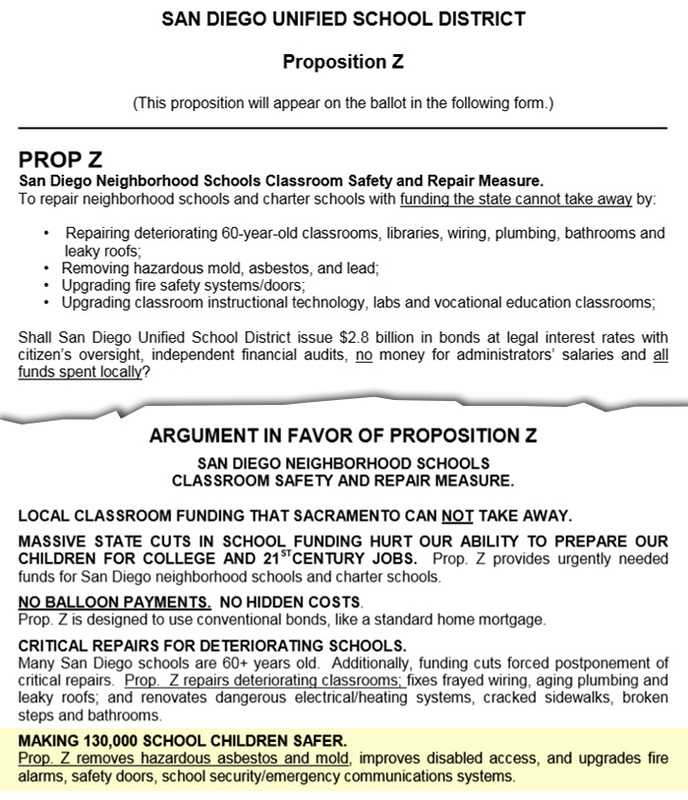 S and Z to voters by saying the money would address critical classroom needs, like removing "hazardous" asbestos. Now, the district says asbestos is perfectly safe, and it doesn't keep track of how much it's hauled out of schools. Just because there’s asbestos lurking under flooring tile in San Diego classrooms doesn’t mean it’s dangerous. In fact, all schools in San Diego Unified are safe for kids, the districts says. They were safe back when voters approved two major school bonds that gave the district billions to make repairs, too. That’s a much different message than the one it pushed as recently as three years ago, when district officials sold Prop. Z, a $2.8 billion school bond, by saying the measure would fund the removal of asbestos and hazardous materials. Schools were in dire need of repairs, taxpayers were told. Leaky roofs needed to be fixed. Asbestos needed to be abated. Lead paint had to be removed. The matter was very urgent; the safety and welfare of 130,000 students depended on the money. The same case was made for Prop. S, a $2.1 billion bond passed in 2008 that was also aimed at repairing crumbling schools. Now, though the district has made progress on other projects envisioned under Props. S and Z, it can’t say how much money it has spent removing asbestos or hazardous materials from schools. Nor can it say how much of the stuff it has actually removed. It doesn’t think tallying up either would be of much use. And the district is right that asbestos is perfectly safe so long as it stays unexposed, the Environmental Protection Agency says the same thing. But that’s not the story voters heard when they OK’d the money. If there was a school that could benefit from San Diego Unified’s $5 billion in school bond money, it would be San Diego High, one of the district’s oldest. And for the most part, it has made out. On a tour of the campus, Lee Dulgeroff, the district’s facilities and planning and construction officer and point-person on bond projects, highlights its newest features. Here’s the school store, where students work and learn entrepreneurial skills. And over there’s the Blue Castle Cafe, decked out like a full professional kitchen, where kids can learn culinary techniques. 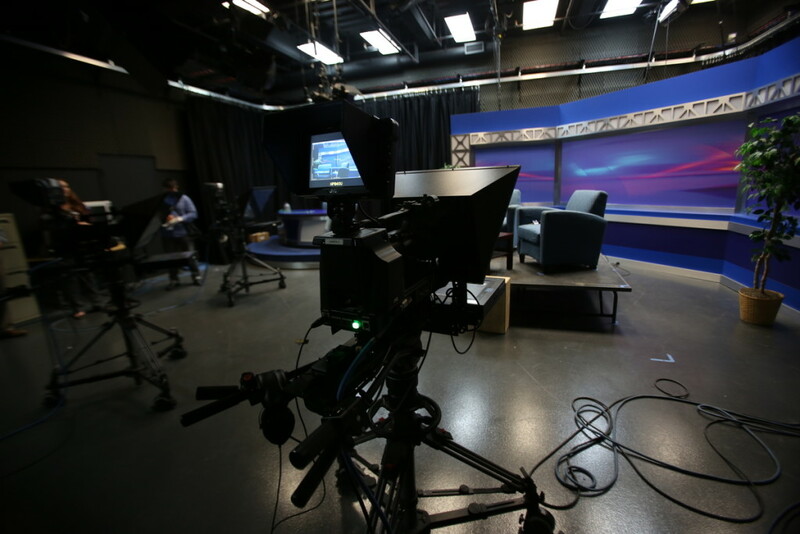 The media arts lab looks like a smaller version of a professional studio, complete with a control room where students can learn production skills. There’s even a couch in the studio where a host can interview guests, just like TV talk shows. But the money hasn’t reached every part of campus. Walk into a room on the east side of campus, and you’ll see scuffed wood floors with worn-off finish. The walls are dingy, the light is dim. The air, musty and stale, smells exactly like an old classroom. Here, the only evidence of bond money is the interactive whiteboard, which can bring up websites and save interactive lessons for students to view. The whiteboard takes up a large section of the room, and gleams like a new, oversized toy. The nearby science building is a before-and-after glimpse of the ongoing renovations. On one side of it is a state-of-the-art science lab set up for a teacher to use a wireless microphone. Across the hall, in a classroom that’s currently operational, old floor tiles still contain the asbestos San Diego said back in 2008 was in urgent need of removal. Voters approved Prop. S six years ago, and planning for projects it would fund was under way. But just a few short months after voters approved the bond came a major malfunction: The economy tanked. As property taxes fell, less tax money flowed to the district. Bonds sales from Prop. S effectively froze. The district realized it wouldn’t be able to pay off its bonds without another cash infusion. So just four years later, the district returned to voters and asked for more. The new bond, Prop. Z, would be another construction bond, to be used for buildings and technology like its predecessor. It came with a tax increase, which freed the district up to sell the rest of the bonds for Prop. S. The two bonds combined would bring the district $5 billion. But first, the district needed to sell Prop. Z to voters. This time, the safety concerns were more prominently featured. Asbestos, lead and mold topped the list. This composite shows the ballot language presented for Prop. Z, and some of the language arguing in favor of the measure. Emphasis ours. “San Diego now has schools built when Harry Truman was president that must have their roofs fixed, electrical wiring replaced and fire alarms updated. New classrooms and science labs are needed in overcrowded schools. Toxic asbestos must be removed. But fast-forward to 2015, and removing asbestos has become a seemingly small piece of retrofitting classrooms at schools like San Diego High. Dulgeroff said that all schools are safe for kids. Just as they were before voters approved the bonds. Most of the asbestos that does exist can be found in the flooring tile of classrooms. It’s not airborne, Dulgeroff said. For it to become a health risk to students, it would have to be dug up or exposed – like what happens during renovations. Even when asbestos is being addressed, it’s often left in the classrooms. The tiles where it resides are simply covered by a layer of carpeting, which Dulgeroff said encapsulates the asbestos and seals in the hazardous material. There’s also some lead paint in buildings at San Diego High. But it mostly covers internal supports, like beams, and whatever’s exposed has been painted over multiple times. For it to pose a health risk, layers of paint would have to be shaved away – a process that requires special equipment and extra safety precautions. Dulgeroff said that it’s difficult, if not impossible, to estimate the amount of hazardous materials that have been removed from school sites. During the design phase of a renovation project, contractors spot-check exposed building materials and test them for lead and asbestos. But those spot checks don’t estimate the quantity of asbestos or lead – only whether, and where, they exist. Nor can the district say how much money it’s spent removing hazardous materials. Those jobs are wrapped up in the overall construction costs and not broken down in such detail, Dulgeroff said. The district, potentially, could tell which schools had asbestos and lead paint removed. But doing so would be an onerous task, and still might not provide an accurate picture of all the places hazardous materials were removed, Dulgeroff said. Besides, nobody really asked the district to document this. Dulgeroff said his department keeps a lot of data – based on what’s important to the community – but this is the first time anybody has asked about hazardous materials. To Dulgeroff, focusing solely on hazardous materials is missing the forest for the trees: Removing hazardous materials is only a tiny slice of the projects that are successfully accomplished. “If anyone would question whether there was work being done, I invite them to come along on a tour,” Dulgeroff said. But nobody is questioning whether any work is being done – only whether it’s the work taxpayers expected when they voted on the bonds. Mark Leslie, president and CEO of the San Diego County Taxpayers Association, said the district’s lack of specifics was the reason the group opposed Prop. Z in 2012. The district put a laundry list of projects on the ballot measure, but to the Taxpayers Association, it looked like more of a menu of options of work that could be done, and less like a checklist of specific projects that would be completed. “There were a lot of promises made in the campaign for Prop. Z, and it’s unfortunate that it’s so hard to determine the progress that’s been made toward those promises,” Leslie said. Of course, there are practical challenges to document work like hazardous material removal. It’s not like you can put the lead and asbestos on a scale and weigh it. But it also begs the question of whether the district dramatized safety concerns in order to get the bond passed. It’s a judgement that former school board trustee Scott Barnett doesn’t mind making. He says the district pitched safety concerns because it would catch voters’ eyes. Barnett has been involved, in one way or another, in the last three school bonds. He chaired the oversight committee for Prop MM, the $1.1 billion bond passed in 1998. He worked for the district as a paid consultant to help pass Prop. S. And he says he was the primary author of Prop Z. Before each bond went up for a vote, the district conducted polling that narrowed down which messages would land with taxpayers, Barnett said. Children’s safety made the list. So they went with that. He’s proud of the bonds. “I’m confident there’s not a better managed bond in the country,” he said, referring to both Prop S and Z. The oversight is tight, he said, and San Diego Unified hasn’t seen the kind of scandals that have rocked other districts, like Los Angeles Unified. But the asbestos concern may have been overstated. And that strikes at the heart of the issue that’s troubled taxpayers since bond spending began. Whether it’s residents who say they never voted for the stadium lights going up in their neighborhoods, or parents who wondered why interactive whiteboards went into classrooms before needs like ventilation and air-conditioning – underlying it all is a suspicion that the district told voters one thing and accomplished another.